Graffiti is evolving into an increasingly expressive art form that allows artists all over the world to create interesting pieces of work that turn the streets into a gallery. We’ve gone and found some of the best graffiti images on roller doors around the world. Whether you’re after design inspiration for your own roller door - or just want to see some art - this is just the thing to get your creative juices flowing. The world loves cats, and the world of graffiti is no different! This smiling cat on a roller door in Melbourne has two flowers for eyes and a colour scheme that really makes this piece of graffiti stand out. With a distinct design, bold colour scheme, and a cute cartoon caricature of a man taking the peace, this roller door graffiti is proof that you can be bold and creative with street art. It’s not just street art for the sake of street art. As we see in this design, graffiti can be used as attractive, effective advertising for any kind of business that’s looking to stand out on the street. Sometimes it’s the simplest designs that are the most effective. As we see here, this roller door graffiti uses bold typography to make a distinct design with a simple, telling message. This design from a side street in Barcelona is a play on the Ying Yang symbol, with a pair of interlocked piranha fish. Bold, contrasting colours make a striking, effective design. This piece by Australian street artist Shida shows just how much you can do with a simple spray can. Here, he’s taken a simple roller door and created an abstract, beautiful design worthy of being hung in any gallery. This piece by Jason Woodside users interlocking colours, lines, and contrasting patterns to create an eye-catching design that really catches your attention as you’re walking past this particular roller door. In another example of the power of typography, Hidden Beauty is a simple black and white design that shows a powerful message. Graffiti can sure be powerful in certain cases. This shows just what you can achieve with spray paint. Roller door Ganesh is a distinct, compelling depiction of the Indian deity that contrasts nicely against the backdrop of the roller door. This compelling piece from the streets of Barcelona is an enduring caricature of a beautiful woman and adds a bold level of character and colour to the street when you’re walking through. This portrait of Marilyn Monroe is another testament to just how creative your average roller door can be when graffitied over. This roller door sits inside an office, and the graffiti is used to decorate what would normally be a boring office environment. Who said roller doors had to be outdoors? This roller door graphic by acclaimed artist Roy Hyland is an interesting depiction of interlocking shapes with a broad colour scheme that makes it such a compelling, effective piece. The giraffe makes the whole thing even better, and would improve the look of any roller door. Borrowing from themes of anime and various Japanese cultural motifs, Samurai Dragon uses the medium of roller door street art to create a compelling piece that will have you looking time and again. This distinct design by acclaimed street artist Paul Walsh features a bold colour scheme and will look good in any light with its bold colours and playful caricature design. This design would look great in front of a food store or something. 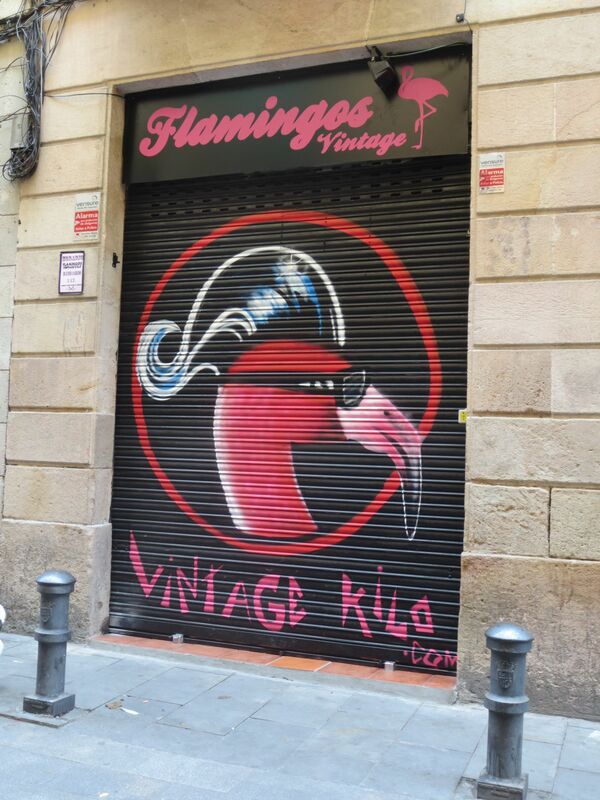 This piece of street art from Barcelona is another bold design that doubles up as advertising for the store. It instantly captures your attention and will have you turning around to admire the depiction of the pink flamingo over and over again. 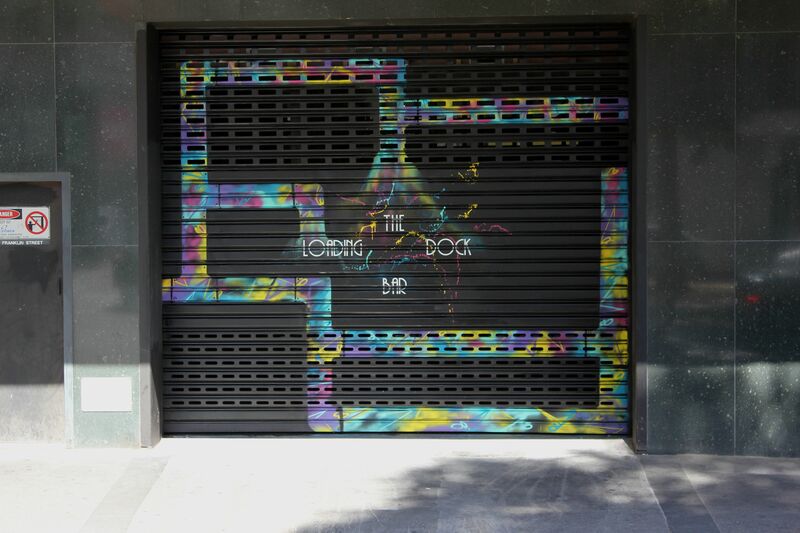 This roller door has unfortunately been graffitied over by another tagger, but you can still appreciate the bold colours and design scheme on the Barcelona side streets. Roller doors are just another canvas for creating a mood for a cafe, restaurant, or bar, and as we can see here for the loading dock bar, it’s created the perfect atmosphere for this venue. This piece is abstract but draws in all the attention, making the store stand out from the others around. People will almost be looking forward for the store to close if they get to look at this kind of art afterwards. Another piece from Barcelona, the epicentre for compelling street art, this depiction of the artist with the world’s most difficult to maintain moustache - Dali - is bold and instantly captures your attention.